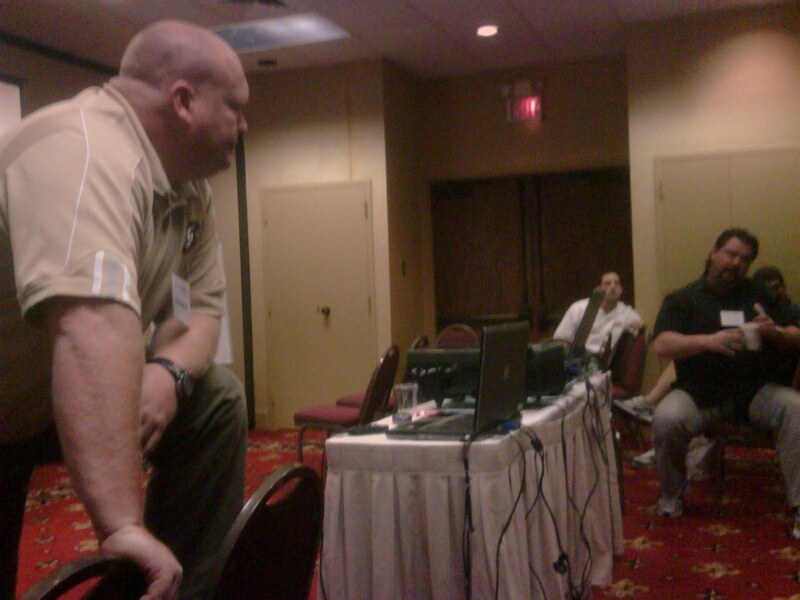 The next few posts will cover a round table-type 4 hour discussion on offensive line play. This was an attempt by ULL OC, Ron Hudson, to kickoff a type of Southern C.O.O.L. clinic. Hudson plans on expanding this forum in the future and it would be something of a 1-back offensive line conclave. The discussions taking place this day consisted of presenting a concept then sharing perspectives between various coaches off that theme. As you will see/hear, quite a bit of information is shared and problems discussed. This deviates from the standard fare of rote lecturing present at most clinics. To start the morning, Southeastern Louisiana Offensive Coordinator, Allen Rudolph, shared his approach to slow (RB) screens. 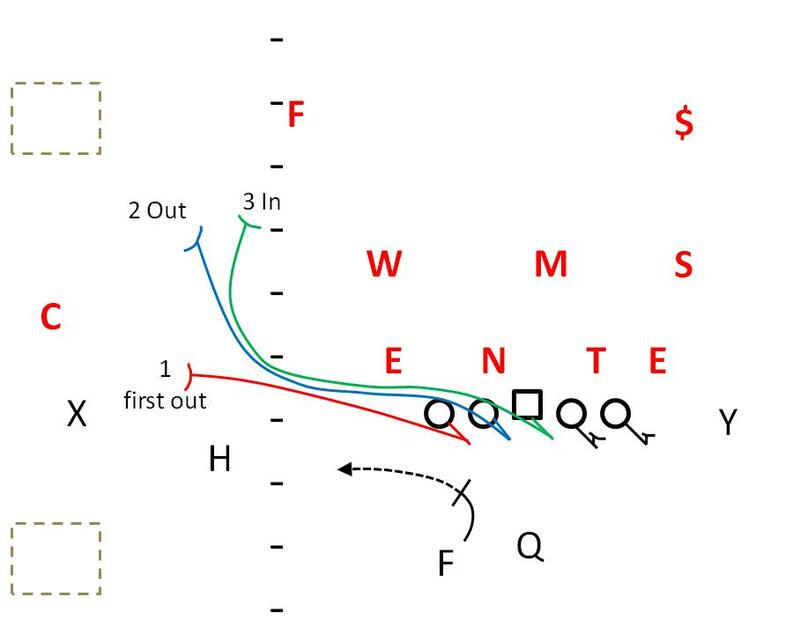 Rudolph bases his RB landmark screens of their 4 vertical principle; receivers will use a 15 yard takeoff unless tagged with a “crack” call (at the LOS). They also will choose to simply run 5-step concept routes, while the back and line engage the screen (Drive /Choice concepts). 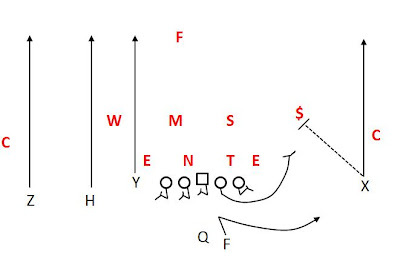 For the split receivers with a "crack" call, they don't want him to settle and engage a box player. Instead, they simply want the receiver to make (any) contact, and "take his head off". At worst, the receiver will have bought the back a split-second to break free. At best, it will knock a defender out of pursuing the play. How do they deal with trash underneath or a DL twist in the way of the screen? If the defensive line stops and peeks, the offensive line will redirect and take it. Rudolph does not use a 'rat killer' (who will double-back after releasing on the screen and pick up any backside pursuit). If confronted with a head up (4) or inside (4i) guy on the tackle, the PST & PSG combo to release ('you' / 'me' call on who kicks to screen and who engages the DE). If both are unsure about the box (look), they will make a 'grey call', meaning it is definite pass call to tackle (‘you’ tackle kicks to screen). Rudolph uses throwback screens in conjunction with slide protection as it allows the QB to set deeper and extend the launch point. Although this can be run out of any formation, the rules remain simple. Engaging the frontside tackle, guard, and center, the assignment depends on how the line sets after the play. 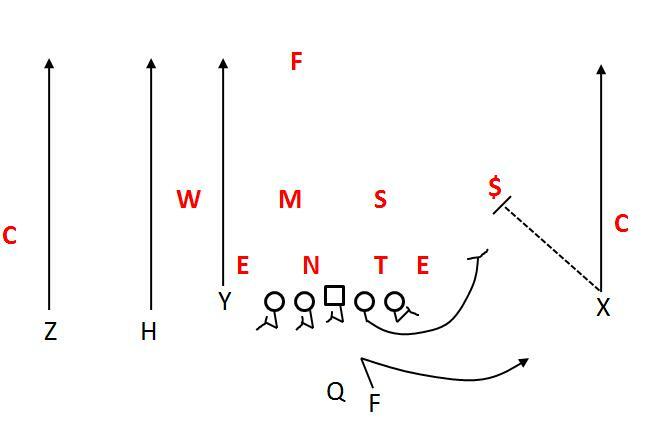 Rather than having static assignments that can cause a play to fail if one man doesn't fulfill his role, he has these linemen release at the same level so they can see and communicate who becomes what role within the screen. The first man out (not always the PST) will pick up the first opposite color jersey and kick out. The second man will continue pursuing the landmark (hash when ball is in the middle / top of the numbers when ball is on the hash) and then engage the first man outside. The remaining lineman will follow the second lineman to the landmark and engage the first man inside. Rudolph allows his linemen to cut on perimeter ONLY if the defender is coming downhill (aggressive). In any other situation, he requires his offensive line to gather their feet and attack the V of the neck (of the defender). The key coaching point on his throwback screen is that the offensive line has to be flat on their release. If the linemen can't see the other (lineman) guy, then they will have no idea what their relationship to the point of attack (1,2, or 3) is. If the line releases at angles, they will often have responsibility overlap and pit two linemen on one defender. Rudolph uses four simple tenets to determine what went wrong when screens don't work (how to screw this up) to ensure that the execution is bulletproof.